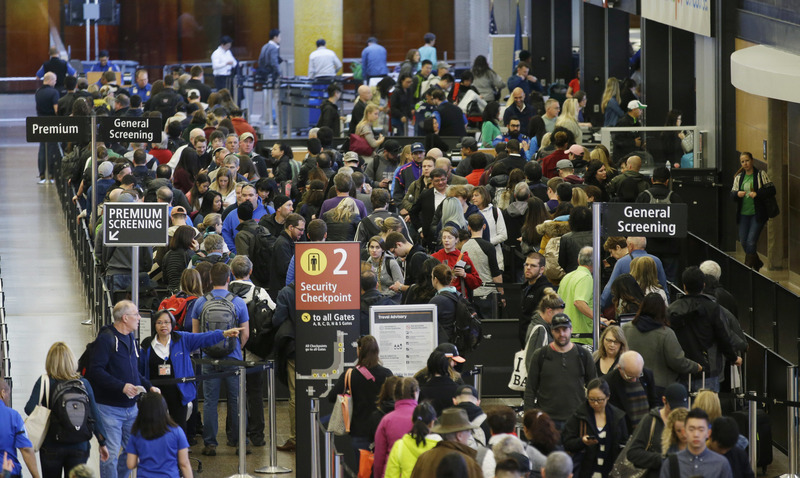 Washington - Two U.S. senators say one way to reduce long airport security lines this summer is for airlines to drop their fees on checking luggage. It’s the latest suggestion for dealing with what could be a hellish summer at the nation’s airports. Airlines are already warning passengers to arrive at least two hours early to get through security and catch their flights. Massachusetts Democrat Edward Markey and Connecticut Democrat Richard Blumenthal said Tuesday they asked executives at 12 airlines to drop checked-bag fees this summer. The senators say suspending the fees won’t eliminate lines but it’s a start. A spokeswoman for the nation’s largest airlines called the senators’ proposal a misguided attempt to re-regulate airlines and warned it could make airline travel more expensive — fares would rise to offset the loss of income from fees. Jean Medina of Airlines for America said it would be better if the Transportation Security Administration had more staffing at the busiest airports and encouraged more travelers to sign up for PreCheck, a program that lets known travelers zip through security faster without removing shoes, belts, jackets and laptops. Last week her group encouraged travelers to post pictures of long lines on social media with the hashtag #IHateTheWait. Bag fees have grown rapidly since 2008, when American Airlines became the first big carrier to charge for checking even one bag. It was a tool that the then-financially troubled industry used to deal with rising fuel prices. Since then, fuel prices have fallen and airlines have earned record profits. The bag fees have remained; they brought in $3.8 billion last year, according to government figures. Many passengers avoid the fees by carrying more luggage on the plane, leading to competition for limited space in the overhead bins. Markey and Blumenthal said the TSA told them that passengers using checkpoints near airlines that charge bag fees have 27 percent more rolling carry-on bags. Medina, the industry spokeswoman, said her group has seen no data to support the TSA’s claim. TSA declined to comment. Long lines aren’t limited to airports where the main airlines charge bag fees. Recently passengers tweeted pictures of long TSA lines at Baltimore and other airports that are dominated by Southwest Airlines, which does not charge for the first two bags. Spokesmen for American and Delta Air Lines said their airlines were loaning workers to help TSA with non-screening duties like handling bins and managing the lines at checkpoints and even offering recommendations for redesigning checkpoints for better flow. Flying used to be a pleasant experience way back when, but for me and many more people it is a get to the airport hours before the flight, then get in this line, then that line, wait, wait, body scan, body check, shoes check, get back and wait more until you finally get on the plane, then sit in compressed seat and get lousy food, get off plane and wait to see if luggage arrives. All of my checked bags for Pesach cost as much as 2 tickets on United. First there were increased fuel costs then Homeland security fees, now they charge for the stupid snacks!?!? Where does this "price gauging" end? Have everyone forgotten that the personnel that checks security has been reduced months ago ,resulting in longer lines in the airports? “ Flying used to be a pleasant experience way back when, but for me and many more people it is a get to the airport hours before the flight, then get in this line, then that line, wait, wait, body scan, body check, shoes check, get back and wait more until you finally get on the plane, then sit in compressed seat and get lousy food, get off plane and wait to see if luggage arrives. The airlines profits have increased on the backs of the numerous different fees for passengers. These fees along with reduced passenger space and amenities are a significant source of income for the airlines, so it would be very surprising to see them scaled back. As long as air travel remains the least time-consuming travel option for trips over 1000 miles each way, the only way this trend will be reversed is at the tipping point where customers cease flying. Considering the high volume of ever increasing complaints from the continuing flying public, the tipping point has yet to be reached!